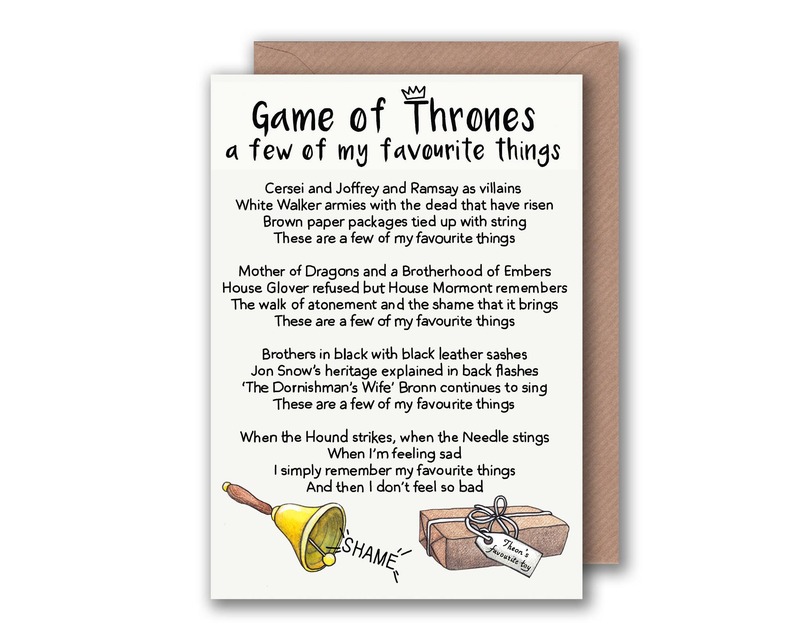 This Game of Thrones 'A Few of my Favourite Things' card makes the perfect Birthday card, anniversary card or Fathers Day Card for any Game of Thrones fan. 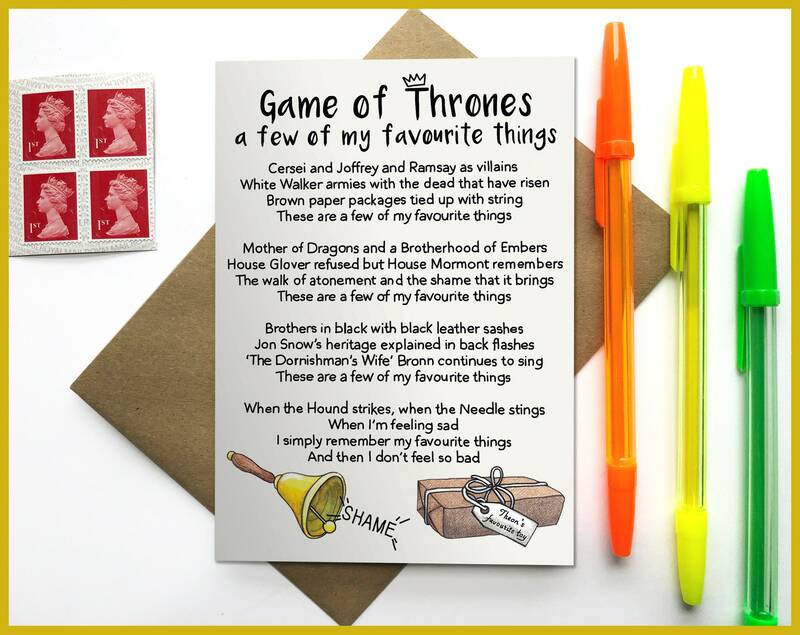 'A Few of My Favourite Things' - Game of Thrones cards are designed and printed in the UK onto 300gsm TruCard, a specialist greeting card material that is coated and scratchproof on the outside and uncoated on the inside so it's easy to write on. 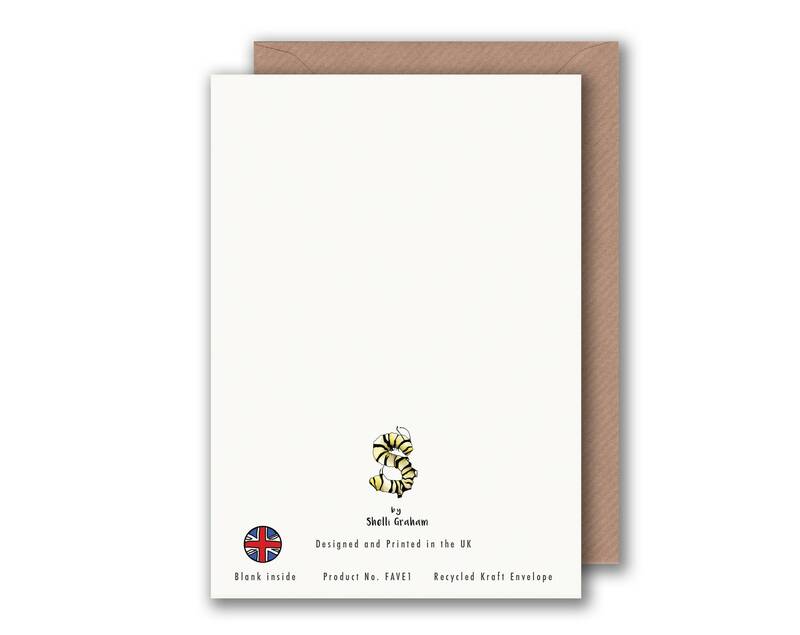 Each card comes with a brown recycled paper envelope and the card measures 105mm x 148mm (A6 in size). Greeting cards are shipped inside a cardboard backed envelope. In an effort to reduce the use of single-use plastics, all greeting cards, available via my online store, are now offered 'Plastic Free'. If you do not need your greeting card to arrive inside a cellophane wrapper please select 'Plastic Free Please!' from the 'Packaging' drop down menu. Cellophane wrapping is still available if requested. This card is perfect for any Game of Thrones fan! All items are carefully packaged so that they arrive in perfect condition, if any items do arrive damaged please let me know as soon as possible. I aim to dispatch all items within 1-3 working days, please send a note with the delivery if an item is required urgently and I will do my best to dispatch within 24 hours (excluding sundays). All limited edition prints are sent recorded delivery, this will require a signature but it does ensure your print will reach you in fantastic condition and on time. Refunds will be looked into on an individual basis. I want every customer to be 100% satisfied with their purchase! quick delivery. Thank you ! Arrived super fast and exactly as described!